In hand reading most information comes from the seven mounts and six major lines. The mounts--pads of flesh that rise and fall over the surface of the palm--vary in each individual hand. The most developed mounts in a hand show the dominant character traits of the individual. Each of these mounts represents an archetype; a personality pattern repeated since the dawn of time. The lines of the palm are the rivers of energy in the map of the hand. Each line represents a specific quality such as intelligence, vitality, and emotional capacity. Many interesting variations in character are told by other factors such as those found in the fingers, skin, and nails. These are known as basic modifiers, which indicate variety and individuality within the mount types. Although we will cover each mount and line in depth, here is a simplified overview to get started. on the personality, and the individual is a combination of the traits of both mounts. These interesting blends produce endless variations in human nature. The table below provides a summary of each mount. There are six major lines and numerous minor ones. In this brief overview we will cover only the major lines. Both will be covered later in detail. Usually every hand has Head, Heart, and Life Lines. The lines of Saturn, Apollo, and Mercury, while considered major lines, appear less frequently. When judging a line, the depth of the channel it cuts and the clarity of the line determine its strength. When a line is deep and clear, the aspect represented by the line is functioning well. When a line is thin or broken, that aspect of the individual is weak or challenged. Do not be frightened by a delicate line. Lines change more easily than any other part of the hand. They are there for guidance and change as we change. Their ability to change shows us that fate is fluid. The Heart Line indicates the physical state of the heart and the emotional capability of the individual. The line begins near the Mount of Jupiter and runs across the hand. When the line is deep and clear the person is steady in their emotions, devoted, and reliable. When the line is thin or broken the individual is more fickle, sentimental, and changeable. The Head Line is indicative of one’s intelligence and ability to concentrate and focus. It begins under the Mount of Jupiter, close to the beginning of the Life Line. When the line is clear the individual can think clearly and concentrate and has a good memory. When the line is thin or broken, mental power is weakened and the individual may experience confusion and lack of focus. If the Head and Heart Lines combine, this is a Simian Line and indicates that the head and heart function as one, that thinking has an emotional quality to it. The Life Line encircles the thumb in a wide arc. It provides information about an individual’s vitality and ability to resist illness. It does not tell the length of one’s life but records how long energy is a gift. When the line is deep and clear, the person’s energy and recuperative ability is strong. When the line is thin or broken energy runs low and the ability to withstand illness is diminished. The Saturn Line is also known as the Line of Security and the Line of Fate. It represents how secure the individual feels. This can be based on internal or external factors. The line begins near the wrist and runs upward toward the finger of Saturn. Every change in the line indicates a new cycle of life. When the line is deep and clear, the person feels secure and conditions are favorable for any undertaking. When the line is missing or defective, the person must work twice as hard. Many people who are “self-made” have no line of Saturn. The Line of Apollo is also called the Line of Art or the Line of Recognition. This line appears rarely, but when it does it confers creative ability and the possibility of recognition in the person’s chosen field. This line runs from the wrist upward toward the Mount of Apollo. The Line of Mercury is also referred to as the Line of Health. This line appears in less than 50 percent of hands. One can have excellent health with or without this line. The Mercury Line describes certain distinct health issues mostly dealing with the digestive system and the liver. If it is deep and clear, it will confer good health and improve even a delicate Life Line. Ellen Goldberg is an internationally known teacher of Tarot and palmistry. She is the founder and director of the School of Oracles and has been on the faculty of the New York Open Center since 1986. She is also a psychotherapist and has maintained a private therapy practice in New York for more than 30 years. She lives in New York City. 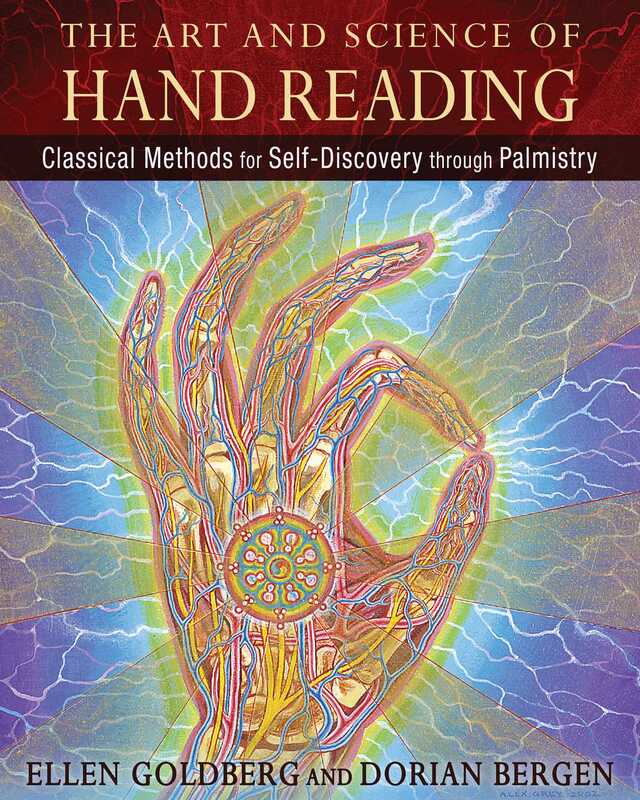 "In this comprehensive guide to hand reading, based on Ellen Goldberg’s 40 years of teaching palmistry and the Western Mystery tradition, the authors make the powerful insights of the hand accessible in an inviting and user-friendly manner. The book presents the character traits and personality archetypes associated with each of the seven mounts of the palm and shows how to determine which are most influential in the nature of the individual"
"Anyone interested in palmistry will be hard-pressed to find a book more thorough than this one. Classical planetary correspondences are melded with crisply defined pictures of hands, hands and more hands. From broad general interpretations to the most minute details, mounds, lines, spacing, phalanges and much more are illustrated clearly, with Goldberg and Bergen helping the reader combine all the myriad parts into a clear and cohesive reading. Well-written and well-designed, this book is a simply beautiful bible of palmistry. Highly recommended."